A lecture can be the telling of an edge-of-the-seat, white knuckle story or the delivery of a dreary monologue. In either case, there is no guarantee that learning has taken place. Even if all eyes are on you, many students could be reveling in their own daydreams behind those glassy stares. While a lecture may be an acceptable way to transfer information to adults, by itself, it simply doesn’t work with kids. Although lecture has been reviled in recent years, it is, without question, the most expedient way to deliver information. The problem is that kids aren’t receiving. Children are so continuously bombarded with verbal stimuli that they are masters at tuning it out. Consider the many hours children spend in front of the TV (according to various studies, between 25 and 30 hours per week), not to mention video games, surfing the Web and social media. Watch them. They talk with friends, do projects and even do homework against a background of noise and distractions. 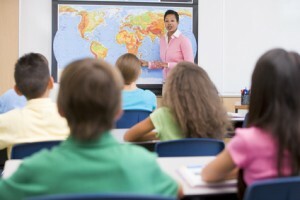 Nevertheless, getting information from lectures is a valuable skill, since this technique is commonly used in high school and universally used in college. When you lecture to students, you are teaching them your subject as well as giving them practice learning from this approach. For young teenagers to receive, however, there must be some incentive. There must be some way to keep them actively engaged. For the less capable students, you could prepare a list of questions to be answered during the lesson. Some could be simple fill-in types where the student would write in the key word while you talk. Other questions might require more thought and a longer answer. Be sure to slow down to give them time to write, however. Note-taking is certainly the time honored way to receive lecture information. Done properly, it is far more than a record of what was said. Ideally, the kids should listen to what you have to say and then write it down in their own words. This forces them to process the information and is their first step in learning it. At its worst, it is simply dictation. Kids will inevitably want you to dictate exactly what they should be writing, but you must resist this. Explain the value of good notes and that you want them to learn this essential skill. Note-taking at this level is not all what you remember from college, though. There the professor entered the room and spoke for an hour or so while you furiously wrote it all down as best as you could. It was left to you to glean somehow from his presentation what the outline titles ought to be, and woe to whomever fell behind. Your students will have no idea how to organize their notes, so you should be painfully explicit about this. Organization requires headings, and you must provide them. Also, you must lecture slowly with many pauses so as to allow them to write. Your students are simply not yet able to listen to you and write simultaneously. The most you can expect is for them to put the information in their own words after mulling over what you have said during the previous minute. Frequent questions about the key points you have covered, as well as requests of a few to read what they have written, will help you gauge their success. Whether they are answering written questions or taking notes, the value of these activities is that it forces them to focus their attention on the lecture. Occasional anecdotal stories might be used for variety. Be sure to tell the kids that your story need not be recorded in their notes. Try to interject humor from time to time. Don’t spend all your time in front of the class, either. You can walk around while you talk, looking at the notes they are taking as you go. This helps you see how they are doing while also showing them that you care about the effort they are putting into it. Practice varying the tonal quality of your voice. Learn to be able to express excitement and wonderment. Use audiovisual aids whenever possible. It might be helpful to have an outline of the topics you’ll be discussing on the overhead projector. The entries could be the titles and subheadings your students will use in their notes. Be sure to keep them covered so that you can uncover them as you get to that topic. Otherwise, they will likely write them all down before you get there, not leaving enough space on their page for the content. The same reasoning also applies to diagrams or lists. Don’t display them until you are ready to stop talking to give them time to write or draw. You don’t want your students drawing or copying while you are still talking. It is entirely appropriate to ask questions while you are lecturing. Some might be designed to test their knowledge of what you have told them. Others could ask them to relate their new knowledge to personal experience. Or, perhaps you could ask them to use the new information to solve some problem or relate it to an artificial situation. Naturally, you will have prepared your lecture questions beforehand. It is helpful to write in the margins of your paper the questions you intend to ask. Hopefully, your lecture is sufficiently interesting to inspire some of your students to ask questions of you. Student questions that ask you to clarify a point you have made should be encouraged. That goes without saying. It is, however, more difficult to know how to handle questions that require you to go beyond the scope of your lesson. For example, suppose you are lecturing about how ancient people interpreted the unusual motion of the planets in the night sky. A student then raises her hand to say that she saw a meteor the night before and wondered how that could be explained. A good answer to that question would require a discussion of the nature of meteoroids, their size and orbit, entry speed into the atmosphere and the effect of friction with the air. All of this could take some time. It is very tempting to stop your lecture and go into this interesting topic. However, it may only be interesting to you and the girl. Beyond that, the time it takes may force you to condense or eliminate part of your planned lecture. Also, if you are so easily distracted from your original purpose, the students may question how important it was. Worse, teachers who frequently stray from the topic often fall victim to students who ask questions for no other reason than to interrupt the lesson, to kill time. It’s far better to say simply that you need to cover the material at hand first, but you hope that she’ll ask the question when you are done. Indeed, she would be pleased if you remembered her question later and offered an answer when there was more time. Really liked what you had to say in your post, Classroom Management – lecture | CLASSROOM MANAGEMENT FOR TEACHING TEENAGERS, thanks for the good read!